The Purpose of this page is to "show and tell" what differences there are between the very early and later model crankshaft designs used in the 69 production year, and a few of the Jan. 70 production 240Z's. Pictured below: On the Left is a standard crankshaft out of an L24 engine. On the Right is the crankshaft out of a very early production 240Z (HLS30 00020). You will notice that the early crank is "missing" a few counterbalance weights! The very early cranks have only six counterbalance weights (actually it looks like they have five and a half counterweights) on them, as opposed to the eight found on the later production crankshaft. 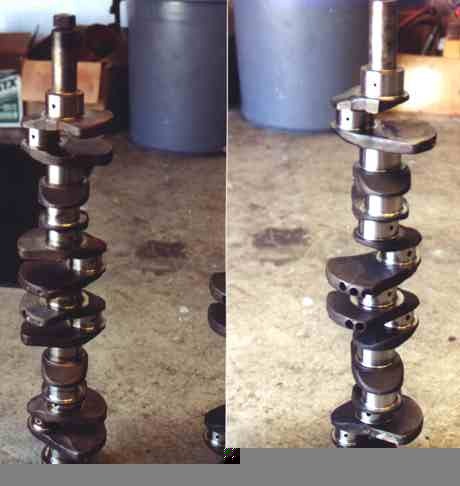 The BRE Team Found That These Early Crankshafts Broke during racing events and by the time they contacted NISSAN in Japan, they were told that the factory was aware of the problem and that only the first full boatload of cars sent to the US used the early crankshafts, after that all cars were shipped with the later design. Engines with serial numbers greater than L24 003607 received the newer design crankshafts. The engines with the older design would be found in cars with build dates of 10, 11 & 12 of 1969 and a few in 01 of 1970 (VINS under HLS30 001000).